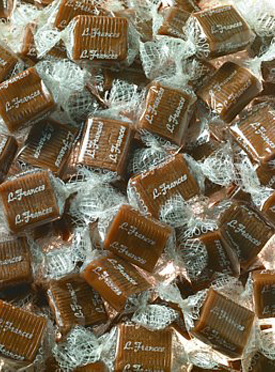 L. Frances Caramel Company was founded with the simple goal of making the best old-fashioned caramels we can. Our caramels are soft, fresh, and made with the finest ingredients available using artisan caramel-making methods. With our factory located in the heart of America’s Dairyland, Appleton, Wisconsin, wonderful dairy products are abundant and provide the foundation for our caramels’ rich flavor. The caramel is slowly cooked in copper kettles which allows the cream to develop an amazing caramel flavor and a beautiful golden color. Our attention to detail at every step of the process sets us apart from other producers, to bring you what we hope is the best caramel you have ever had.